Considering the political climate of our times, it feels appropriate to begin sharing this wonderful book chronicling Maria Merian's life, out last February, with some words from Joyce Sidman's introduction: "Imagine this girl, forbidden from training as either a scholar or a master artist because she is female. Aware that in nearby villages women have been hanged as witches for something as simple as showing too much interest in 'evil vermin'." By the 1660s, when Maria was thirteen, over 20,000 women had been tried and executed as witches in Germany alone. This exquisite biography opens with a table of contents, then a glossary and the introduction. 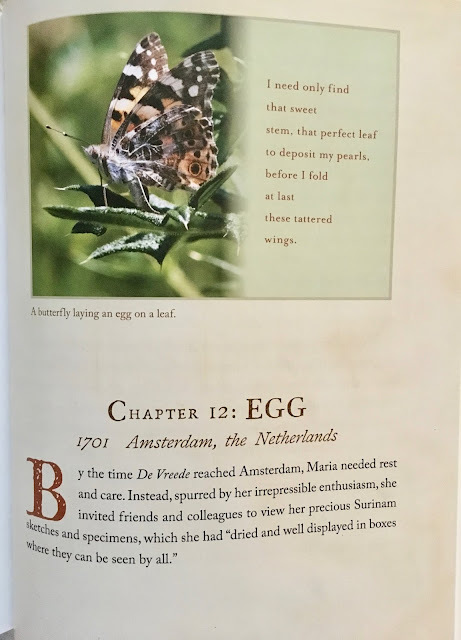 The chapter titles themselves offer an overall view of the life cycle of a butterfly, and cover, chapter by chapter, Maria's life cycle, too. Clever in its execution, at the opening of each chapter also is one of Sidman's poems. Written from the insect's view, these themselves would make a beautiful story, for the caterpillar and for humans. Here is one example from Chapter 3, FIRST INSTAR (the phase between moltings): "All that glittering green/before me. . ./how much of it will I devour?" Maria became a leading botanical artist, naturalist, and (possibly) the world’s first ecologist, as she depicted insects—in all their developmental stages—alongside their botanical food sources and helped establish the idea that butterflies and moths come from caterpillars. Before her observations, many "experts" considered that they and other animals, like amphibians, sprang from muddy earth or water-- 'spontaneous generation'. 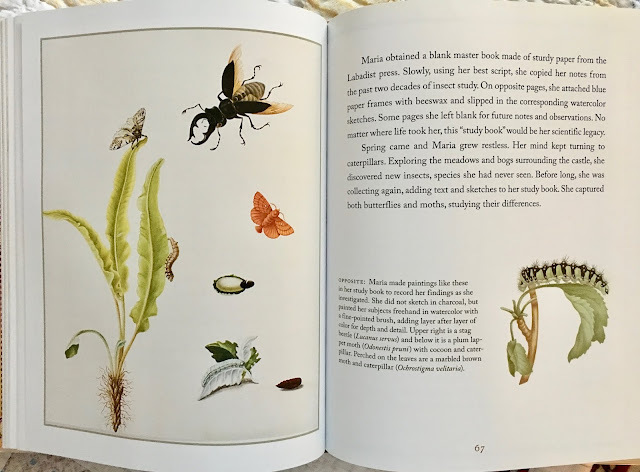 In her earliest observations, Maria became sure, after those months of observations, that those minuscule eggs that became caterpillars, then entering the chrysalis stage, finally emerging as butterflies or moths, were indeed connected. Sidman adds quotes from Maria's journals as she combines her life story along with the history of the time as well, like explanations of the witch hunts, the way science worked before photography, and religion in the 1600s. 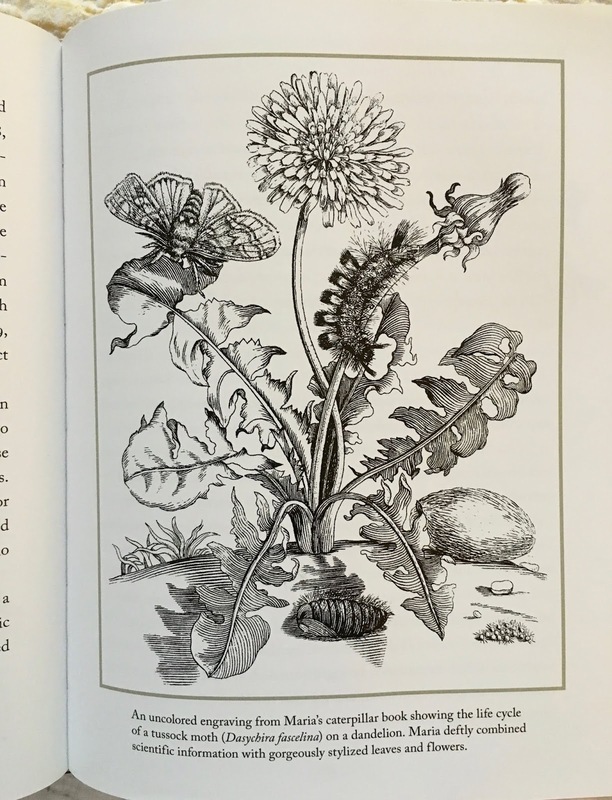 One quote showed the persistence that never wavered, even in her later life when ill: “She had the curiosity of a true scientist, the patience it took to raise insects, and the superb artistic skill necessary to share her observations." In addition to the background information of Maria's life, shown are numerous artistic treasures of her detailed artwork of moths, butterflies, flowers, trees, etc., as well as additional art from others depicting the life at that time like the first museums, moth versus butterfly, slavery in Surinam etc. 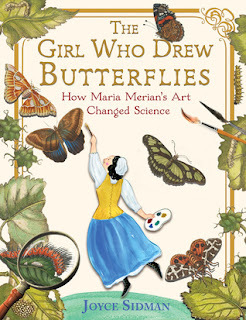 Also, The Girl Who Drew Butterflies focusses on the highlights of Merian's life (from her childhood to her solo travels with her daughter Dorothea to Surinam), presenting a both interesting and always engaging, and marvelous story of someone who did not allow the mores of her time to stop her learning. Remember these times held no cameras. Maria had to concoct and blend her own paints, construct her own paintbrushes, then reproduce the art onto metal plates through etching. If the resulting pages were in color, that means each page of the book(s) were hand-colored. (Few books were made and they were expensive!) I enjoyed this book very much. I loved this book--and was so surprised that there was enough content for a longer piece of nonfiction! And I loved that Joyce Sidman surrounded Maria's story with history and background images of those times. It is a terrific book! This is an amazing story Linda! How do we even imagine her inspiration and bravery to accomplish what she did! I know what you mean. It is a challenge to understand, but we can admire her & others. It's a wonderful story. Thanks, Vicki! Considering what she was up against in her life, it feels good to have her be our inspiration, doesn't it? Hope you'll find the book sometime, Bridget. Thanks! Linda, this story is inspirational. I never heard of this amazing woman before. This book is a treasure. 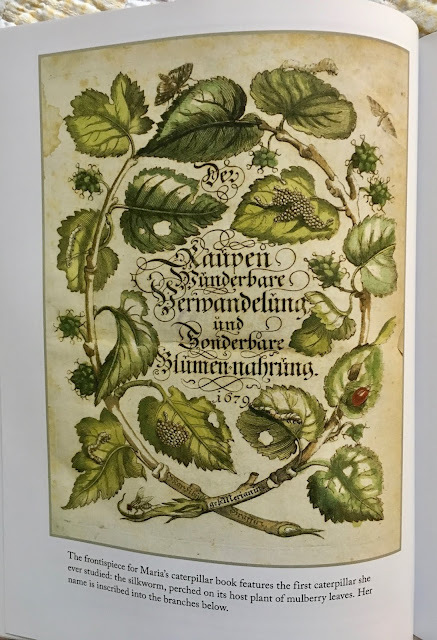 In my collection, I have botanical renderings from the 18th century. They are amazing to me because of their detail and preservation of the past. My mother had the reproductions rendered in the early to mid 1900s that also are in my house. Your reveal of this book makes me recall what I have here and what this female heroine of her times was able to produce. How wonderful that you have such a collection, Carol. I hope you read this book and enjoy it, too. It's lovely. 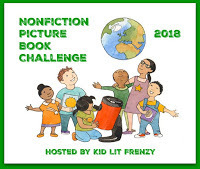 Non-Fiction Wednesday - Hoax or Not?